Check out your entryway/front door area. Gather up all of the things that tend to linger in this area. If it’s by the front door because it needs to go somewhere, then put it in a bag to grab the next time you’re walking out the door! And speaking of bags, take a minute (or 10) to clean out your purse / laptop bag / backpack / etc. No need to carry around a bunch of excess junk in this new month! Move on to your bedside table. For me, this is always a place where random tiny things accumulate. I’m talking 39 bobby pins and ponytail holders. Take a second to remove anything that doesn’t belong there, so that you can go to sleep and wake up to a simple and streamlined space! And I mean really make the bed. Use all of your decorative pillows, throws, whatever you need to do to make it look/feel like a hotel bed! You’ll thank yourself when you go to get in it tonight! Make sure your "getting ready space" is in order. Make sure that every hairbrush, bottle of nail polish, tube of mascara has a home. 1 for nail polish, nail polish remover, cotton balls, etc. 1 for skin care related things like lotion and face wash.
1 for toothbrushes, toothpaste, mouthwash, and floss. Everything doesn’t need to be arranged perfectly, but it does need to be categorized in a way that’s easy enough to follow every day! Round up all of your clothes. Round up all of your towels. Now, let’s move to the kitchen! Deal with every piece of paper in your home. If a piece of paper has been lingering around for a while because it requires some type of action, go ahead and take that action so that you can file or toss the paper! 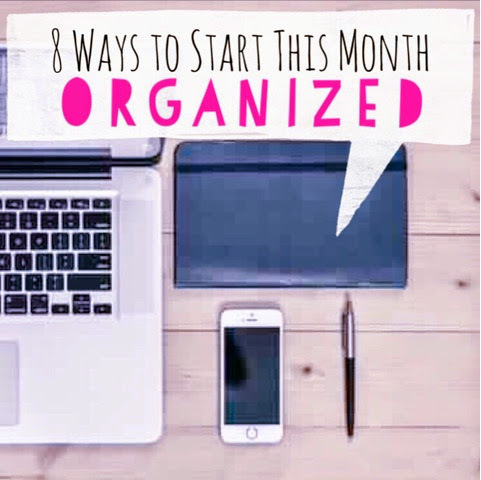 Do you have any suggestions or tips to help start a cleaner and more organized new month?! Add them in the comments below!